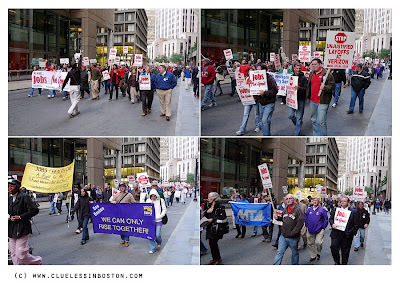 Various unions marching for jobs Thursday night on Franklin Street. It was unexpected to see a march like this, but luckily I had my little camera with me to catch a few shots. And thanks for sharing these pictures with us! Great collage as well, good job! A sign of the times and as unemployment is a lagging indicator, there will be more to come over the coming months. Nice "photoreportage" yet also sad. Very journalistic shots (it's a compliment! ), and very interesting. An unprepared encounter, which allowed you to catch a testimony of this moment. It's so good to see activism. Excellent work here. There are so many marchers. This is such a hard time and I fear it may still get harder before we see real improvement. Thank you for posting this. It's important that we all see these images. a sign of the times and the true price of this recession. Job security has never been this fragile and your pictures reflect this fear. Very rare to see people marching on the streets like in France. Always good to have a camera in hand!